Photo credit: Todd Brown, Media Solutions. The issue addressed by this policy is the potential for inappropriate influence by commercial interests on the educational and instructional content of educational programs for health science students. The Health Sciences Council recognizes that disclosure of a potential conflict of interest does not necessarily, in itself, mitigate the potential for an inappropriate influence of, for example, a consulting relationship with a commercial concern, on the views of a faculty or staff member. Disclosure does, however, create transparency for any possible conflict of interest and allows the learner to be fully informed of those relationships. A contemporary health sciences education must not only transmit scientific knowledge, but also equip the student with the skills necessary to evaluate and interpret information, an essential tool for lifelong learning. The constituent schools of the Health Science Council share many common attributes and concerns, and those similarities are the foundation of these policies. Each of the Health Science schools is subject to its own specialized accreditation process, reflecting the fact that despite those general similarities, there are important and specific distinctions among the skills, knowledge, and aptitudes required by graduates of each program at the time they receive their degree. Consequently, these policies form a framework for implementation by each school, but each school must assume the responsibility of tailoring specific details of the policy and its implementation to the needs and expectations of its own program. This policy is in addition to, and does not supersede, UW–Madison policies and procedures on conflict of interest. Recognizing and addressing conflict of interest is part of the professional development for all health sciences students. As a result, policies governing interactions with industry entities in health sciences schools should model good practice as part of the professional training for these students. Industry or Industry Representatives: Manufacturers, servicers, and other vendors of pharmaceutical, medical and veterinary medical devices and supplies, commercial products, and medical and veterinary medical testing companies and their employees, representatives, agents, and vendors. Student: All individuals enrolled in courses offered by one of the UW Health Sciences Council Schools or completing a course of study as a trainee/fellow within a UW Health Sciences Council School. 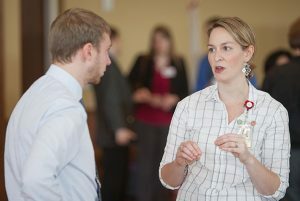 Faculty and Staff: All individuals holding paid employment in any of the UW Health Sciences Council Schools. UW Health Sciences Council Schools: School of Medicine and Public Health, School of Nursing, School of Pharmacy, School of Veterinary Medicine. Common Space: Any space commonly shared by the UW Health Sciences Council Schools. research funding by companies that make medicines, vaccines, or devices discussed in the course. The use of brand names is discouraged in teaching presentations. If it is important to identify a product by brand name for clarity, student awareness, or to discuss differences between products, the reason for brand identification should be made clear in the course syllabus and/or orally during the presentation. Commercial for-profit entities shall not distribute gifts of personal value (for example, but not limited to, pens, back-packs, items of clothing [with or without the company logo], books, CD-ROMs, DVDs, gifts to graduating students, sports/concert event tickets, etc.) to faculty/staff for the purpose of further distribution to students of the UW Health Sciences Schools or for their own use. – Commercial for-profit entities shall not distribute samples of medicines or other products, be they prescription or non-prescription items, to faculty/staff for the purpose of further distribution to students of the UW Health Sciences Schools or for their own use. 2.1 While in UW health sciences facilities, faculty/staff/students will not interact with industry representatives in any context that is not in compliance with this policy regulating such interactions. 2.2 While in UW health sciences facilities, faculty/staff/students will not use or exhibit promotional items that display industry brand names. Student presentations and projects should not include industry-sponsored materials. 2.3 Faculty/staff/students will not accept any personal gifts or promotional items from industry. (See also any school-specific related COI policies for faculty for additional restrictions.) Members of industry may donate grants and scholarships for students or for the unrestricted support of educational programs if approved by the appropriate health sciences school administration. Administration will be solely responsible for selection of recipients and distribution of such grants. Faculty will not distribute industry-funded items to students unless approved by the appropriate health sciences school administration. 2.4 Faculty/staff/students may attend industry-sponsored events, such as educational programs, at their own discretion. In such cases, faculty/staff/students shall not receive any remuneration or gifts in exchange for attendance. (See also any school-specific related COI policies for faculty for additional restrictions.) Students may opt out of these activities without adversely affecting their evaluation in any course. 2.5 Industry sponsorship for student organization events is strongly discouraged. Student organizations must request approval from the appropriate health sciences school administration for any event involving industry. In certain circumstances it may be of value, because of unique knowledge/experience, for scientists/clinicians employed by commercial for-profit entities to participate in the education of students of the UW Health Sciences Schools. Any such participation in lectures/seminars must have a specific general educational focus; presentations that focus on and/or promote a commercial for-profit entity’s product, device, or service shall not be permitted. The individual’s potential conflict of interest because of their commercial for-profit entity affiliation must also be disclosed in any written materials distributed and orally at the start of their presentation.Commercial for-profit entities shall not employ students of the UW Health Sciences Schools expressly to serve as representatives of the commercial entities within the UW Health Sciences Schools. Commercial for-profit entities shall not distribute or provide gifts of personal value (for example, but not limited to, pens, back-packs, items of clothing [with or without commercial entity logo], books, CD-ROMs, DVDs, gifts to graduating students, sports/concert event tickets, restaurant meals, registration and/or travel reimbursement to company planned and sponsored educational meetings, etc.) to students of the UW Health Sciences Schools.Commercial for-profit entities shall not distribute samples of medicines or other products to students of the UW Health Sciences Schools, be they prescription or non-prescription items.Knowledge of nutritional products plays a significant role in the management of obesity and specific diseases in veterinary medicine. For the School of Veterinary Medicine, it shall be permissible for pet food production companies to continue to donate foods to the teaching hospital for patient feeding and to school-wide student organization for subsequent sale to students, faculty, and staff as a fund-raising mechanism to student education. (This is a nationwide program at all schools/colleges of veterinary medicine.) This program at the UW-Madison School of Veterinary Medicine is not restricted to a single manufacturer, and will remain widely available to an array of manufacturers and products, to provide students with a wide exposure to currently available products. The UW Health Sciences Council Schools recognize and appreciate the important role of financial support of general educational programs by industry. To ensure that such support does not inappropriately influence educational content, however, such support must be provided within established guidelines. Specifically, commercial for-profit entity support of student education in the UW Health Sciences Schools shall most appropriately be through donation to a general educational enhancement fund, with written acknowledgement of the entities supporting the fund in materials distributed regarding the fund. No single commercial for-profit entity shall have the ability to deny participation by any other organization (either competitor commercial for-profit entities or other organizations of any kind), nor stipulate the use of the funds. Funds shall be reserved for unrestricted support of student scholarships or for the unrestricted support of educational programs.The provision of food by a commercial entity at an educational program, with recognition of the audience of that gift, constitutes the provision of a personal gift of value. Consequently, commercial for-profit entities shall not provide, with direct attribution to a single commercial company, food in association with an educational event within the UW Health Sciences Schools spaces. Funds in unrestricted support of educational programs from multiple donors may be used for such purposes.For the School of Veterinary Medicine, “Pharmacy Fairs” shall be permitted up to twice per year within School facilities so that students have an opportunity to learn about various products available in the marketplace. This is important exposure for students since veterinarians, at the day of graduation, are independent small business owners. Consequently, they must routinely interact directly with pharmaceutical/vaccine/device sales personnel and possess the knowledge and skills to make independent decisions on the purchase of pharmaceutical and biological products. However, such “fairs” shall be open to any interested companies, and companies shall provide no food, enticements/gifts, product giveaways, or other items of personal value- only educational displays and information. Commercial for-profit entities shall not provide financial contributions that entail direct attribution to a single commercial company of a gift to a UW Health Sciences School for non-educational student events (e.g., new student orientation, awards banquets, classroom-to-clinics promotion ceremonies, graduation ceremonies, etc. ), other than normal recognition activities that may be conducted in partnership with the UW Foundation or as indicated in Section 4.2 of this policy. All financial support must be for unrestricted support of student scholarships or for the unrestricted support of educational programs (see 3.3 above). 3.5 Any contributions to a non-University affiliated professional organization sponsoring such events shall be governed by the conflict of interest policies of that organization. 4.1 Displays, meetings, and events held in common space may not distribute promotional or educational materials provided by industry. 4.2 Small signs acknowledging contributors are allowed but may not include industry logos or allow individual industry displays. 4.3 Events held in common space may not include distribution of industry funded gifts to students. Potential employers may participate in a school-sponsored activity highlighting career and/or training opportunities for the purpose of job interviews and/or potential employment. However, such activities may not include student gifts, promotional items, food, and use of displays containing corporate logos or other promotional materials. Small table top educational displays are allowed. Each school shall develop an approval process and implementation mechanism for these policies.- Recognizing different educational needs of students within different schools and the potential need for time to transition to these policies and/or secure alternative funding sources, a goal for full implementation is August 1, 2013. However, each school will be expected to begin implementation of and transition to these policies, and engage in the consideration and development of school-specific policies under the umbrella of this policy, immediately.The final format of these policies as adopted by each school shall be distributed to all students and faculty of that school on a yearly basis at or near the start of the fall semester. In addition, each school shall designate an official to address questions and provide advanced interpretation of the policies. These policies shall be in force through May 31, 2015, at which time the Deans/Directors of the UW Health Sciences Schools shall designate a working committee representing all UW Health Sciences Council Schools to review the policies and recommend any changes, additions, deletions. Disputes regarding potential undisclosed conflicts by faculty/staff of the UW Health Sciences Schools shall be referred to the faculty/staff member’s departmental executive committee (or similar governing body) for discussion, investigation, and resolution.Disputes regarding potential violations of these policies by students of the UW Health Sciences Schools shall be addressed by the school/program’s existing academic/non-academic standards review process or other designated procedures specific to each school.Disputes regarding potential violations of these policies by representatives of commercial for-profit entities shall be referred to the Dean/Director of the involved UW Health Sciences School(s), or when necessary because of their own potential conflict of interest in relation to the potential violation, a Provost’s designee, for review and any appropriate action. Any adjudication issues or questions that cannot be resolved through the processes described above or any issues requiring adjudication between schools/colleges will be referred to the Health Sciences Council.